Farming is not a one-day affair; rather it requires several days of hard work and proper agricultural procedure to be followed to get the intended output. A range of farming practices has been emerged to increase the productivity, of the agricultural land. Two such farming practices are intensive farming and extensive farming. Intensive Farming is a farming method that uses higher inputs and advanced agricultural techniques to increase the overall yield. In contrast, Extensive Farming is one in which more and more land is brought under cultivation to increase the output produced. This article excerpt is presented to give a clear view of the difference between intensive and extensive farming, followed in different parts of the world. Meaning Intensive Farming refers to an agricultural system, wherein there is high level use of labor and capital, in comparison to the land area. Extensive Farming is a farming technique, in which large farms are being cultivated, with relatively lower inputs, i.e. capital and labor. Population It is practiced in densely populated region. It is practiced in moderately populated region. Intensive farming refers to the intensification and mechanization of the agriculture, with the objective of increasing the productivity of a particular land. This is possible through the high-level use of inputs such as capital, labour, fertilizers, insecticides, pesticides, weedicides etc., which results in increased yield of the crop per hectare. In this system, the use of inputs is comparatively higher than the land area. It can be applied in animal husbandry too, wherein a large number of cattle are reared in small space, as the law of the concerned jurisdiction allows. Further, medication for livestock is adopted to increase their productivity. The essence of intensive farming is that it depends on the chemicals to accelerate the growth and increase the crop yield. Extensive Farming is a system of cultivation, which uses limited inputs, i.e. labour, investment, machinery etc., in comparison to the land under cultivation. In this method, traditional methods of farming are given preference. Further, the productivity is based on the natural fertility of soil, climate and terrain of the area and so it is practised in large farms to achieve higher yields and to achieve profitability. The total crop production is high, due to large land holding, but the low in terms of per unit production. Due to less use of chemical fertilizers and pesticides, it is an environment-friendly method, as it does not damage the environment. Intensive farming is an agricultural method of increasing the crop yield by heavy use of chemicals such as fertilizers, pesticides, etc. and machines. On the other extreme, extensive farming is a farming method, wherein acres of land are being farmed, with lower inputs, i.e. labour and investment, in comparison to the land. While intensive farming is performed in the areas, which are densely populated, extensive farming takes place in the region of a moderate population. In densely populated areas, intensive farming can easily be practised because it requires the small area for cultivation. However, the land in such areas is expensive. On the contrary, extensive farming can be undertaken in the areas where there are huge farms for cultivation. Nevertheless, the farms are relatively less expensive. The farms under intensive farming are located near the market area, which minimises the cost of transportation and distribution. Conversely, in intensive farming, land under cultivation, is located in remote areas, which increases its cost of transportation and selling it to the market. Intensive farming results in high production per unit of land, but per person is less. Unlike, in extensive farming large farms are cultivated, and that is why the total production is high, but per unit production is low. To sum up, the primary focus of intensive farming is on the quantity of the crop produced, whereas extensive farming stresses on quality. 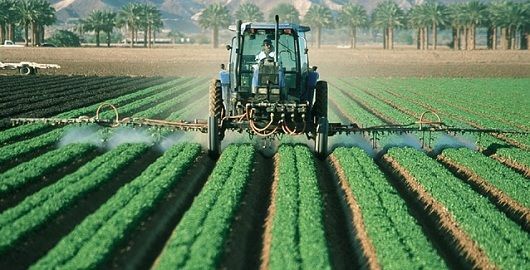 Intensive farming causes damage to the environment, as there is a high usage of chemicals which not only reduces the fertility of soil but also contaminates the food, which is not in the case of extensive farming.